The $1,699 Optoma UHD51A is targeted at people who want to live at the leading edge. Along with 4K UHD resolution and HDR, it is the first projector to feature voice-activation through Amazon Alexa. When you compare specs for the UHD51A and the Optoma UHD50 ($1399), you get the impression they are essentially identical. Both have RGBRGB color wheels and the 0.47" DLP chip, and they have identical ratings for most specs. The only obvious differences are the UHD51A's $300 higher street price and its Optoma Smart Home Skill set for Amazon Alexa, which adds tricks like letting you tell Alexa to turn the UHD51A on or off and adjust volume. However the UHD51A adds other features beyond the Alexa support including frame interpolation (FI), Full 3D support, a built-in USB media player that allows 4K video playback, and support for wireless display from mobile devices with an optional Wi-Fi dongle. The UHD51A also comes with a two-year warranty rather than one for the UHD50. There was a difference in brightness between our test units. Optoma rates both models at 2400 ANSI lumens, but we measured the UHD51A at 1,690 lumens in its brightest color mode compared with 1,998 for the UHD50. Even so, the UHD51A is bright enough with video optimized settings to light up a 175" 1.3-gain screen in a dark room or a 110" screen with moderate ambient light. Low Lamp Mode. Eco mode lowers brightness by about 33% compared with the full power setting. Zoom Lens Light Loss. The 1.3x zoom lens drops brightness by only about 12% in the full telephoto setting, which is little enough to ignore in most cases when deciding how far to place the projector from the screen for a given size image. Color Brightness. The UHD51A performs well on color brightness tests. Even in the Bright mode the color output measures 80% of white, and in all other presets it exceeds 85%. Brightness Uniformity. The measured brightness uniformity for the UHD51A is 63% at the wide-angle end of the lens and 68% at the telephoto end--a little low for a home theater projector in this price range. With a solid white test image, there's minor visible fading on the left and rightmost 5% to 10%. Those who are particularly aware of low uniformity may find it bothersome. Others will never notice it because the brightness change isn't obvious and it is on the edges of the image which you rarely focus on. Video Optimized Lumens (SDR). Even with default settings, color in Cinema mode is well within a realistic range, although moderate tweaking of Color Matching settings gives more accurate color. The more important issue with the defaults is low contrast and lack of three dimensionality, which is easily fixed by adjusting brightness and contrast. After adjustments, black is suitably dark; contrast, shadow detail, and three dimensionality are all excellent; and brightness is unchanged. The measured 1,153 lumens with optimized settings is enough to fill a 175" 1.3-gain screen in a dark room. Eco mode's 769 lumens is enough for a 145" screen, and it gives you the flexibility to move to Bright power mode as the lamp loses brightness with age. For rooms with ambient light, the video optimized settings with Bright power mode can still light up a 110" screen. Color Preset Mode Performance. The UHD51A's Cinema mode is its second brightest mode. Game and Reference modes both deliver a touch lower brightness, with color that's similar in hue but less saturated. HDR Sim is just a little green shifted, but nowhere near as much as the brightest mode. As with most projectors' brightest modes--Bright mode has an obvious green bias. Unlike many DLP models, changing the Brilliant Color setting to 1 (which is off) from the default 10 doesn't improve color accuracy enough to matter. If you need the extra brightness to combat ambient light you may be willing to use it occasionally if you don't mind the green tint. Frame Interpolation. The UHD51A's FI offers three settings besides Off. The factory default setting is Low, which smooths motion enough to notice while still showing a bit of judder in pans or an object moving across the field of view. However, there's little-to-no digital video effect, which leaves nothing to gain from turning it off. Unlike the maximum setting in many projectors, High doesn't smooth motion entirely, but it also adds only a minor digital video effect. You might prefer a more aggressive version of FI for live and recorded video, but this more subtle version is better for film. 4K HDR Performance. Unlike some 4K projectors, the UHD51A handles the switch from SDR to HDR input and back again fully automatically. When it detects HDR, it switches to HDR color mode as the only choice. When it detects SDR, it switches back to whatever color mode it was previously set to. The HDR mode has four settings: Bright, Standard, Film and Detail. All four deliver a compelling picture with excellent contrast, dark blacks, and a good sense of three dimensionality. The main difference between them is that at each step from Bright to Standard to Film the image gets darker overall and shows less shadow detail separation. 3D Performance. The UHD51A is one of the few 4K UHD projectors that offers 3D at 1080p, which alone makes it a strong contender if you have a library of 3D discs. It handles 3D nicely, with no crosstalk in my tests and just the typical hint of 3D-related motion artifacts. You can adjust picture controls in 3D mode, but even with the defaults it delivers a highly watchable picture. As with any projector, 3D isn't as bright as any of the 2D modes, but the brightness drops far less in 3D than with most projectors. Unlike most Optoma models the UHD51A supports DLP-Link glasses only. As an aside, the UHD51A didn't always recognize 3D input from Verizon FiOS. When that happens, you have to switch the video source back to 2D material, set the projector to 3D, and then switch the source back to the 3D material you want to watch. Optoma says it is looking into this issue. Rainbow artifacts. As with most DLP projectors, the UHD51A can show rainbow artifacts. However, they don't show as often as with many other models. Even in a contrasty black and white clip I saw very few, and I saw even fewer with color clips. If you don't see these artifacts easily or don't find them bothersome, they won't be an issue. If you're sensitive to them or don't know if you are, try to buy the projector from a dealer that allows easy returns so you can test it out for yourself. Onboard audio. Should you need to use the UHD51A's onboard audio instead of an external sound system, the two 5-watt stereo speakers deliver good sound quality and enough volume for a small to mid-size room. Fan noise. The UHD51A is notably quiet, rated at 28 dB in full power mode and 25 dB in Eco mode. In a small room you can hear the fan in quiet moments, but it is low pitched, steady white noise that tends to fade into the background. Optoma recommends using High Altitude mode at 5,000 feet and above. In Eco mode it is still quiet enough, but in full power mode it is loud enough to consider using some sound deadening material around it. Input lag. With FI off, the projector measures a minimum of 68 to 70 ms lag depending on the color mode. Throw Distance. The UHD51A's 1.3x zoom lens allows a throw distance for a 120" 16:9 image from about 10.5 to 13.8 feet. You can use the Optoma UHD51A Projection Calculator to find the throw distance range for the image size you want. Lens offset. With the UHD51A right side up, the lens shift allows the bottom edge of the image to be anywhere from even with the centerline of the lens to as much as 14% of the image height above the centerline. This is an ideal range for setup on a low table or inverted in a ceiling mount. There is no keystone adjustment to square off the image, which means you should avoid any situation that forces you to tilt the projector up or down to hit the screen. This effectively rules out options like putting it on a high shelf behind the seats, which will usually force you to tilt the projector downward. The Optoma UHD51A's most eye-catching feature is its unique (for the moment) support for Alexa, but that's not the best reason to buy it. Voice commands are currently limited to turning the projector on and off, adjusting volume, changing the input source, and controlling the USB media player. For all other settings, you still need to use the remote or controls on the projector itself. Sorely missing, but promised to be added shortly, are commands to change the Display Mode, FI setting, and color mode. It is hard to argue that these voice command features, even with the promised additions, are by themselves worth the $300 higher cost for the UHD51A compared with the UHD50. However the other additions--FI, 3D, built-in USB media player, support for mobile devices, and boosting the warranty to two years--add enough value to easily justify the increased price. The Optoma UHD50 has a slightly faster input lag at 57 ms, but it isn't enough to make any practical difference. And although our UHD51A measured about 85% as bright as our UHD50 in their Bright modes, it measured 94% as bright for Cinema mode, which is what you'll want for best picture quality. And the difference is within the range of expected variation from one unit to another in any case. Most important, the Optoma UHD51A is easily bright enough even in ECO mode to light up a 140" 1.3-gain screen in a dark room and produce a compelling picture in SDR or HDR. 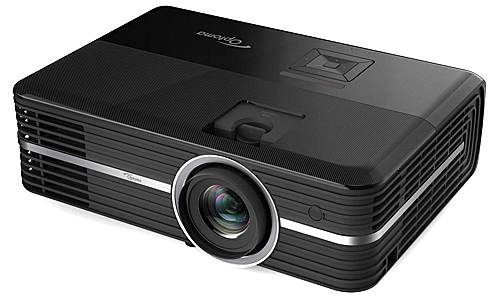 And it even offers 3D for 1080p, which the UHD50 and most other 4K projectors don't. That's more than enough to make it an excellent value at $1,699. Wonderful PJ - spectacular color/contrast and the 4K is better than my old eyes can see. Quiet too. FYI: DLP-Link 3D (What the UHD51A uses) and the HTC Vive do **NOT** play well together. They are both heavy IR transmitting technologies and don't share the local IR bandwidth very well. One must be off while using the other. "There is no keystone adjustment to square off the image, which means you should avoid any situation that forces you to tilt the projector up or down to hit the screen. This effectively rules out options like putting it on a high shelf behind the seats, which will usually force you to tilt the projector downward." Short of presentations in a conference room, who has the ability to place a projector in the dead center of their screen in a home theater? People in the seating area would hit their heads on a projector hanging low enough to be centered on a screen, unless the screen is so high everyone has to look up to see it. This removes viability of this projector for me, which is unfortunate because it seems like a fairly common projector feature. Roy, you have misunderstood the keystone issue. This projector, like pretty much all DLP projectors, has a built-in upward throw angle, or vertical offset. It throws the picture entirely above the centerline of the lens if the projector is table mounted. If ceiling mounted, it will throw a properly formatted image downward. The only time you'd need keystone to square it up is if you tilt the projector at an angle to hit a screen, which you would likely have to do if you were projecting over the heads of the audience from a shelf behind the seats. While I applaud Optoma's continuing 3-D support in the 4K projectors, I sooo wish they retained the VESA 3D sync port which makes RF glasses a possibility. I've used both DLP-Link then RF 3-D glasses, each for a couple of years, and RF is the hands down winner for me. All DLP projectors with a VESA out option still can be set for DPL-Link if that's the way someone wants to go. Are you sure that uhd51a brightness is lower than uhd50 in general, or it just happened to be with your test unit? I am trying to decide between two, and would like to go for 51a (for 3d and other features), but if the brightness is significantly (10-20%) lower as you mentioned, then I would go for uhd50 because I have some ambient light. Please help. Thx! Sushil, we can only measure the sample we have, and we cannot make any representation that the samples are representative of the entire production run. On our particular units, our UHD50 test unit meausured about 15% brighter than the 51A, but ony in the maximum Bright mode. In video modes they were only 6% apart, which one could attribute to manufacturing variance. But to be honest, even a 15% lumen variance in video is very difficult to see with the human eye; you need a light meter to detect it. Sushill, the Top 10 ratings are driven by popularity -- the less expensive models tend to be more popular. It has nothing to do with whether one is "better" than another for all uses. Keystone correction is a horrible thing in reality, it is best avoided whenever possible. Easiest to avoid by setting up the projector completely level. The lens shift adds great flexibility to inverted overhead mounting options. I have run an Optoma HD141X in my living rooom for years now, mounted high on a cabinet near the couch, and it also has no keystone correction. It is aimed down for sure, I couldn't even adjust the legs enough to get the picture low enough on the opposite wall, so there is a wooden mount that I built for the back of it to get the angle that I need. No one has ever complained about keystone. It's been our TV since November of 2014, and while I've replaced the color wheel and the bulb each once in that time, both were quick, easy fixes with nothing but a philips head screwdriver. I know that some people are very picky about their video, but unless you're a videophile, I wouldn't hesitate to pick one of these up anyway. I plan to do so myself in July. What if I have the projector on a high shelf behind the seats, but not tilted. Would it project the image shifted downwards, it does it have to be upside down? Can it be changed to shift the image upwards or downwards?